In most games, when an enemy dies, they just disappear. In Call of Duty, you don’t see bodies stacked up on the battlefield. But in Hotline Miami, all of the blood and bodies stick around exactly where you left them, and it’s a powerful mechanic to really get the player to notice all the killing that’s been going on. 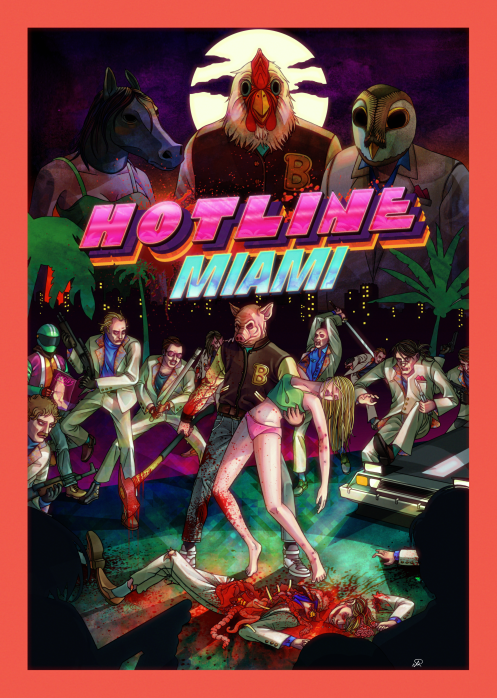 And that’s exactly the point – without going into details of the plot, the whole purpose of all the violence in Hotline Miami is a commentary on violence in the gaming industry. There’s a great Gamasutra article on the topic if you want the full-on spoiler-riffic details. Okay, so the game wants you to notice all the people you’ve killed. Does that mean that backtracking is cool, as long as there’s some deeper meaning? Is it okay to make the player get all the way out of the 10th level of the dungeon because it’s more realistic? No, of course not. Everything in this game is fast-paced, and getting out of the level doesn’t take more than 30 seconds, even on the larger maps. And, it offers the player a chance to seek out any collectables they may have missed along the way. There aren’t a ton of things to collect, but you’re probably going to be too busy killing people the first time through to worry about the collectables that much. Backtracking in games is still generally a bad idea, though in certain circumstances, it can be effective. While there aren’t many laws of user experience, I might postulate that don’t waste the user’s time would be one. Hotline Miami is an excellent example of backtracking that is both meaningful and not annoying. What other games have you played that included backtracking in a positive – or at least neutral – way? Drop a note in the comments! This entry was posted in Action, PC, Uncategorized and tagged game design, game experience, indie, ps3, steam, user experience, ux by mark d. Bookmark the permalink. I believe Okami is a pretty good example too. The entire game is about going from location to location to restore the land. Near the end of the game, something bad happens and you have to run throughout the entire land to reach your destination in time while an epic soundtrack is being played. While this is a few minutes of backtracking, it gives you the chance to appreciate all your restoration work, which gives an extra sense of urgency to reach your destination because you want to protect your hard work. Plus, since you run very fast and flowers grow around you while running, it makes you feel really badass. Pretty effective. That sounds like the “riding home” scene in Red Dead Redemption. Man it would be great if flowers grew around you when you’re riding around in the desert though.